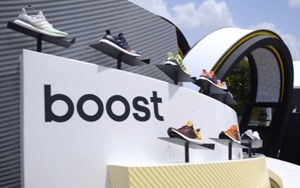 Adidas is launching an interactive experience called Boost Experience by adidas, that the company says will appear at running events nationwide. The idea, per the Portland, Ore.-based U.S. sales arm of the company, is to build brand awareness of the company's Boost technology, which Adidas launched in 2013. The promotion will visit 13 events this year starting at the The San Francisco Marathon at Pier 39 on Sat., July 25. The Adidas space on the ground at the race has an exterior interactive "Kinetic Wall" with what Adidas calls "Boost capsules" that move in response to foot traffic. The visual capsules are analogs to the capsules that comprise the material making up the Boost shoe-sole material. There is also a product try-on area where Adidas staffers help out with “test-drives” of the Ultra Boost, Energy Boost, Pure Boost, Sequence, Glide and Adios footwear lineup. The company says the try-ons involves the staffers helping participants do warm ups and exercises. People who try on the footwear can also get their experience recorded and displayed on a full-size LED video wall, that incorporates runners' energy output with a mirror image made entirely of Boost capsules. A social media component, mandatory now in pretty much all consumer brand experiential programs, gives participants an embedded GIF of their experience that gets emailed for sharing. Another mandatory element is the photo booth/selfie opportunity. In this case, the “Boost Yourself” booth photographs are transmitted to the virtual Boost capsules on the visual wall. Adidas introduced Boost two years ago into the ultra-competitive running category, which has a product cycle almost as brisk as consumer electronics, with which it will overlap with digital applications. Adidas says it has also introduced the Boost product to basketball, baseball, tennis, snowboarding and training.